Line A from March 24th to October 31st, every 30 minutes. Line B from April to October, every hour. Boats operate from 08:50 to 19:55 - Check the timetable for specific route times. There\'s no bad time to experience Venice! Be sure to time a ride so that you catch sunset on the lagoon and the Grand Canal! We are comparing Venice Hop-On-Hop-Off Boat Prices from leading ticket suppliers and Try to find you Cheap tickets prices on the market. 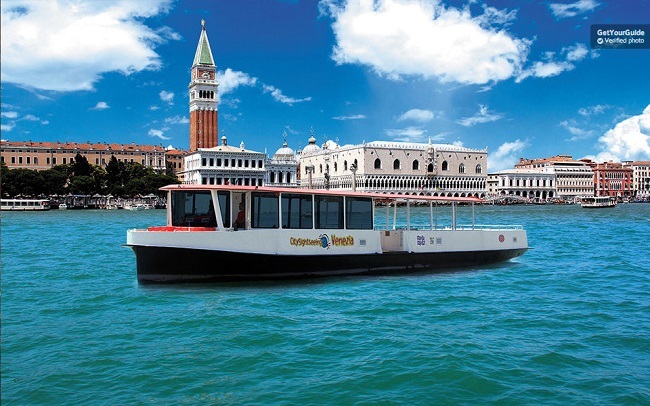 The large air-conditioned boats, with free wifi onboard, can comfortably transport up to 300 people around Venice, a UNECSCO World Heritage Site, with enough seating for everyone to enjoy the panoramic views from the water. Venice needs to introduction, this beautiful cultured city is made up of 150 canals and more than 400 bridges – The hop-on-hop-off boat helps you move between all of the top sightseeing destinations including St Mark\'s Square, the beaches of the Lido, and the famous islands of Murano (where the glass is made) and Burano (the island full of colourful painted houses). Easily move around Venice taking in the top views and reaching the top attractions along the Grand Canal and out into the Lagoon. A great way to admire Venice from the water. Sightsee at your own pace. If you enjoy the ease and convenience of a hop-on-hop-off tour whether you\'ve done bus or boat tours in other cities, this is similar though lacks live/recorded audio commentary – You have to download an app and listen through your phone. Doesn\'t stop at as many places as the local ACTV water bus – You may prefer a more DIY approach. Your Experience With Venice Hop-On-Hop-Off Boat? Board the boat at any of the listed stops, or, first stop at the visitor centre located inside the train station to pickup a map and timetable where you can also redeem your voucher if required. Then, choosing if you want to use line A or line B, take a seat or stand as you delight in watching the sights of Venice pass by as the boat takes you along the Grand Canal and out into the lagoon. Line A, which takes between 120 and 150 minutes to complete a loop has 4 stops along the Grand Canal and also continues on to the islands of Murano and Zattere on the Lido. Line B concentrates only on the outer islands stopping at Murano (the island where the famous Murano glass is still made), Torecello, and Burano (the island known for its colourful houses) this route taking approximately 120 minutes in full. You can hop-off at any of the stops to go sightseeing, rejoining the open-top boat at the stop you alighted at or one of the later stops or simply stay onboard the whole time and take in the architecture, the water, the sights, the smells, and the sounds that make up the incredible Venice experience. What Venice Hop-On-Hop-Off Boat Includes? 24 hour or 48 hour hop-on-hop-off sightseeing boat ticket. Unlimited travel on both Line A and/or Line B within the ticket time frame. Download the free app before you board to enjoy audio guides onboard plus an audio walking tour from your phone or tablet. Make sure you ask if you\'re boarding the Line A or Line B boat if unsure so that you don\'t travel to the wrong place. Travelers Reviews about Venice Hop-On-Hop-Off Boat? Travellers talking about this hop-on-hop-off boat on Viator, GetYourGuide, and TripAdvisor agree that it\'s a cost effective and convenient way to move around the top sights of Venice if only staying for a short time but note that it\'s not of the same standard as other Hop-on-hop-off tours due to lack of either live commentary or audio commentary played over speakers and give lower marks for that reason – Not knowing what sights they\'re passing and not realising that there is a downloadable audio guide. Travellers note that the ACTV water bus could be a better option for people wishing to do more sightseeing and who wish to travel on the inner waterways as the hop-on-hop-off has limited stops and only travels along the Grand Canal and out into the lagoon to Lido and the islands. Tickets are validated from the time of first use and expire 24 hours or 48 hours later. Both paper tickets and e-tickets are accepted. Plan ahead – Know what you want to see/do and the stops you want to hop-off at – Also be sure to know if you want Line A or Line B.
Download the app to make full use of the audio guides accessible from your Android or Apple device. Hop onboard at any of the listed stops.